Thoroughly updated for the 2005 NEC, this handy book is a “vest pocket” solution to the everyday problems a trade person encounters in the field. 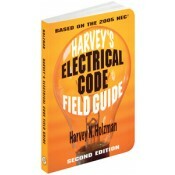 Harvey’s is a very concise presentation of the basic formulas, tables and charts. Logically structured around the basic NEC code topics, it contains simple, clear illustrations to amplify, clarify and simplify the concepts presented. It’s the perfect little guide for anyone who needs a quick and easy to use on-the-job review. • Completely updated to the 2005 NEC. • A unique organization that contains a simple table of contents and logical units organized around the broad NEC categories. • Includes a section of terms with definitions, color codes and symbols. • Contains simplified tables that are much easier to read. • Enables you to find formulas fast. • Unit 1: Formulas, Rules & Laws – AC & DC. • Unit 2: Service Entrance, Feeders & Related Devices. • Unit 3: Branch Circuits. • Unit 4: Electric Motors & Motor Controls. • Unit 6: Electrical Terms, Color Codes & Symbols.